Need Info on this Oak Grandmother Clock , Estate Find !!!!! 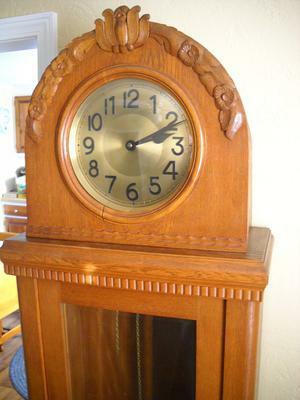 Would appreciate any info on the Oak Grandmother Clock. It is made of Oak and about 6 ft tall, has 2 weights. 2 numbers on the movement 15387 and 60 sch. and Manthey Finowstr10 ? on back. It is located in Missouri and eventually be for sale.